Beef Checkoff has continued to work toward regaining confidence of retailers and consumers. While the marketing environment for beef products in Taiwan has been more challenging this year since the government there began testing for growth promotant residues, the beef checkoff, through its contractor the U.S. Meat Export Federation Taiwan has continued to work to regain the confidence of retailers and consumers. Recent promotions with hypermarket chain RT-Mart and supermarket chain Taiwan Fresh show those efforts are paying off. A top-three chain in Taiwan, RT-Mart with its 26 outlets has been a long-term partner with the beef checkoff, so it recently agreed to a two-week joint promotion on U.S. beef. Under the theme of "U.S. Beef Festival," the promotion featured boneless short ribs, top blade muscle, chuck short ribs and short plate. As an incentive for shoppers, a sea salt gift was added for each purchase over 699 Taiwan dollars (about $23). The promotion provided desired short-term results: a 17% increase over pre-promotion sales levels, reaching 136,400 pounds. "This is a very positive result given the fluctuating level of imports and consumer cautions regarding imported beef," says Alex Sun, USMEF-Taiwan marketing manager. The checkoff coordinated a second promotion with a longtime U.S. beef merchant, Taiwan Fresh, which has 40 supermarket outlets in central Taiwan. 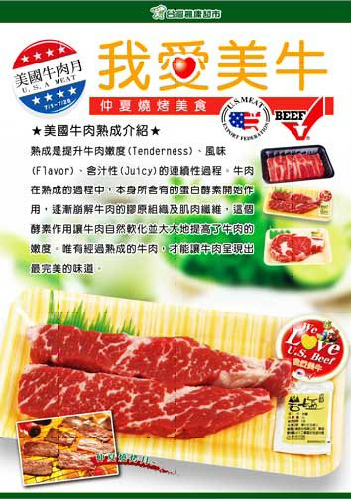 A loyal partner that has continued to stock U.S. beef despite some negative consumer reactions, Taiwan Fresh conducted its own month-long promotion, featuring chuck flap, top blade muscle, chuck tender, chuck roll, bone-in and boneless short ribs, rib fingers, ribeye, pastrami, heel muscle and eye of round. While not all retailers share their post-promotion sales levels, Taiwan Fresh disclosed that its joint promotion is generating lasting sales benefits. Prior to the promotion, U.S. beef sales levels for the period were roughly 5,580 pounds. During the promotion, they more than doubled to 11,440 pounds. In a sign of growing consumer confidence, Taiwan's sales of U.S. beef only declined slightly in the following month, holding at 10,780 pounds. During the promotion, consumers were provided with information on wet-aging techniques as well as information on how to prepare the variety of beef cuts. "Supporting retailers strategically contributes to maintaining the level of chilled beef imports among importers and allows for more frequent purchases by retailers," says USMEF-Taiwan Director Davis Wu. "This helps enhance buyer loyalty and helps us in the long run." Through the first nine months of 2011, U.S. beef exports stand at 57.1 million pounds valued at $142.4 million – decreases of 6% and 5% respectively when compared to last year, but showing signs of rebounding in September. For more information about your beef checkoff investment in foreign marketing programs, visit MyBeefCheckoff.com.